Senior citizens scammed, lose millions reads the headline. 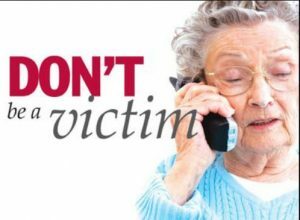 It’s true, seniors, one of our most vulnerable populations, lose millions to telephone fraudsters every year. Instead of living out their years in peace and tranquility, many aged see their life savings gone. The Federal Trade Commission (FTC) reports that consumers lost nearly $488 million to what it calls “imposter scams” in 2018. Fraudsters pretending they’re from the government represent the biggest share of the impostor cons, according to the FTC report. Other impostor scams come follow similar scripts. For example, people saying they are from a business; that they are helping your family or friends; or that they are from a technical support team working to fix your computer. Senior citizen victims of impostor scams lost hundreds of dollars apiece in 2018 says the FTC. Seniors aged 80+ reported a median loss of $1,700, compared with $751 for those in their 70s and $600 for those in their 60s. Unfortunately, seniors take this seriously and fall for the bait. Overall, those in their 60s reported the highest total fraud losses to the FTC in 2018 at $184 million, followed by those in their 50s at $168 million and in their 40s at $158 million. How can senior citizens protect themselves against telephone fraudsters?